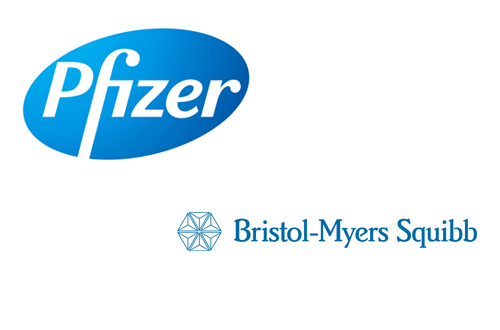 Pfizer and Bristol-Myers Squibb have secured the first approval for anticoagulant Eliquis in atrial fibrillation (AF) patients with a green light from the European Commission. Oral factor Xa inhibitor Eliquis (apixaban) has been cleared for preventing stroke and systemic embolism in adults with non-valvular AF plus one or more risk factors. The drug, which was approved last year for preventing venous thromboembolism (VTE) in adult patients who have undergone elective hip or knee replacement surgery, is an important new drug for both Pfizer and BMS as they cope with generic competition to blockbuster brands. Eliquis "is the only oral anticoagulant that has demonstrated superior risk reduction versus warfarin in the three important outcomes of stroke and systemic embolism, major bleeding, and all-cause mortality", according to Pfizer and BMS. The news is a boost to the companies, which have run into some hurdles bringing Eliquis to market for AF in the US, having been forced to resubmit their marketing application there last September after an initial version was turned down by the FDA. Speaking on a recent conference call, Pfizer's CEO Ian Read said: "the FDA has resumed its review of the Eliquis NDA and set a new action date of March 17, 2013". Meanwhile, Eliquis is also under review in Japan for the AF indication, with a decision possible before the end of the year, according to BMS' CEO Lamberto Andreotti. AF is an important new indication for Eliquis as it opens up a larger target patient population than VTE and could elevate the drug to blockbuster status, providing it can compete with other therapies already on the market. Two rival anticoagulants - Bayer's Xarelto (rivaroxaban) and Boehringer Ingelheim's Pradaxa (dabigatran) - are already approved to prevent stroke in non-valvular AF patients, but Pfizer and BMS believe they can position Eliquis as the market leader. Eliquis "is differentiated not only versus warfarin but also versus the other agents", said Giovanni Caforio, president of BMS' US pharmaceuticals business on the firm's third-quarter results call. In clinical trials, Eliquis demonstrated good efficacy but also a very favourable safety profile, particularly with regard to bleeding risks. Meanwhile, Eliquis could also face competition in the next couple of years from Daiichi Sankyo's edoxaban, another factor Xa inhibitor which is currently in phase III testing in AF with results due in 2013. Edoxaban was launched in Japan under the Lixiana brand name for VTE prevention after surgery last year.